Method1: Soak Poppy seeds for 30 mins. Grate a coconut or if using frozen one, defrost it. Now if You have an awesome wet grinder you can put the soaked poppy seeds, coconut and 2 green chilies in the grinder and blitz it to get a smooth paste. Method2: Dry grind the poppy seeds to make a dry powder. Pour it out in a bowl and make a thick paste by adding a splash of water. Grate a coconut or if using frozen defrost the grated frozen coconut. Now in your regular mixer add the poppy seed paste, coconut and 2 green chilies. Blitz to make a smooth paste. 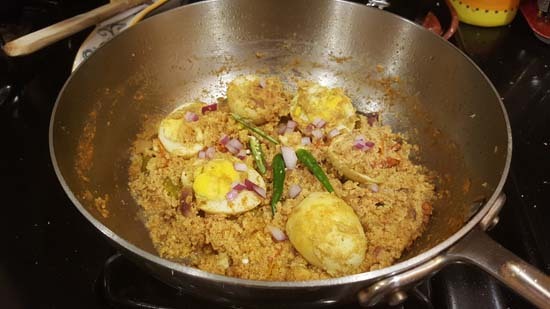 With a pinch of turmeric powder fry the boiled eggs. Now I fry them lightly until they are a pale yellow. Some folks like frying until the skin crinkles and the egg is a shade of reddish orange. You stick to your style. Now add the posto+narkel paste and saute. Add 1 tsp of kashmiri mirch powder and a little turmeric powder. 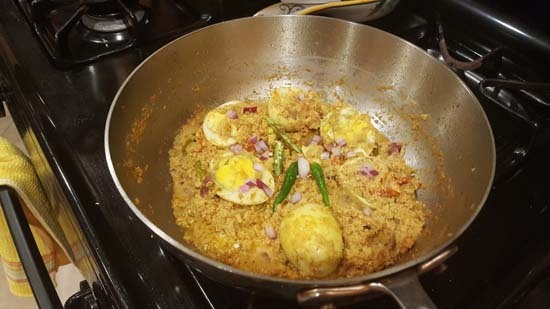 Once you are satisfied with the taste of the narkel-posto add the halved eggs, sprinkle the chopped onion reserved for garnish, Drizzle 1 tsp of Mustard oil and then put the lid back on. At low heat let it simmer for about 4-5 minutes. Will make it using duck eggs. Thanks for the recipe. The recipe sounds good! Will try.